Whiplash occurs when a forceful impact (commonly from behind) causes your head and neck to snap forward and back in an abrupt, violent motion. It is commonly seen in car accidents and contact sports. 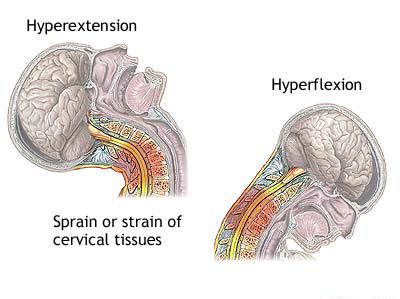 Whiplash (also called cervical hyperextension injury or flexion-extension neck injury) refers to an injury to the soft tissues of the neck including the ligaments, tendons, and muscles. The symptoms of whiplash include neck pain and stiffness. Upper back and shoulder pain can also occur. Most whiplash injuries heal within weeks, but if left untreated they can linger and turn into chronic conditions that last for years and lead to pain and sometimes disability. See a doctor to evaluate the extent of your injuries. Most injuries are similar to those of Neck Strains and include soft tissues injuries to the muscles and ligaments but whiplash can damage the cervical discs as well. A physician will often request a variety of diagnostic tests to confirm the area of injury. Sometimes Cat Scans or MRI are used to determine the extent of the injury. First aide for whiplash includes R.I.C.E. therapy (rest, ice, compression and elevation). Ice may be applied for the first 24 hours, followed by gentle active movement. A visit to a physical therapist will allow you to receive a personal exercise program and treatment plan. Returning to activity is encouraged, however modifications in your previous training will likely be necessary. Low impact, exercise and a great deal of flexibility work will be needed before you can return to your previous training routine.